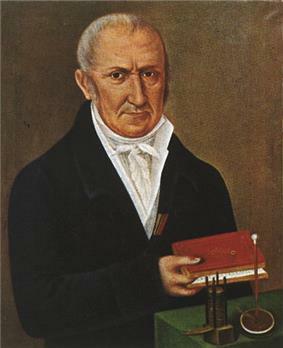 Alessandro Giuseppe Antonio Anastasio Volta (18 February 1745 – 5 March 1827) was an Italian physicist and chemist, who is credited as the inventor of the electrical battery and the discoverer of methane. He invented the Voltaic pile in 1799 and the results of which he reported in 1800 in a two-part letter to the President of the Royal Society. With this invention Volta proved that electricity could be generated chemically and debased the prevalent theory that electricity was generated solely by living beings. Volta's invention sparked a great amount of scientific excitement and led others to conduct similar experiments which eventually led to the development of the field of electrochemistry. Despite his professional success Volta tended to be a person inclined towards domestic life and this was more apparent in his later years. At this time he tended to live secluded from public life and more for the sake of his family until his eventual death in 1827 from a series of illnesses which began in 1823. The SI unit of electric potential is named in his honour as the volt. Volta was born in Como, a town in present-day northern Italy (near the Swiss border) on 18 February 1745. In 1794, Volta married an aristocratic lady also from Como, Teresa Peregrini, with whom he raised three sons: Zanino, Flaminio, and Luigi. His own father Filippo Volta was of noble lineage. His mother Donna Maddalena came from the family of the Inzaghis. In the years between 1776 and 1778, Volta studied the chemistry of gases. He researched and discovered methane after reading a paper by Benjamin Franklin of United States on "flammable air". In November 1776, he found methane at Lake Maggiore, and by 1778 he managed to isolate methane. He devised experiments such as the ignition of methane by an electric spark in a closed vessel. Volta also studied what we now call electrical capacitance, developing separate means to study both electrical potential (V ) and charge (Q ), and discovering that for a given object, they are proportional. This is called Volta's Law of Capacitance, and it was for this work the unit of electrical potential has been named the volt. 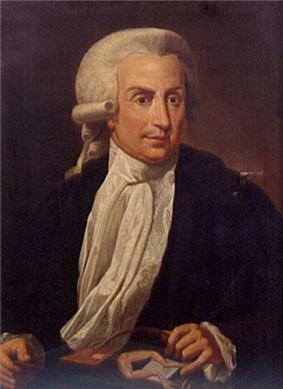 Luigi Galvani, an Italian physicist, discovered something he named "animal electricity" when two different metals were connected in series with a frog's leg and to one another. Volta realised that the frog's leg served as both a conductor of electricity (what we would now call an electrolyte) and as a detector of electricity. He replaced the frog's leg with brine-soaked paper, and detected the flow of electricity by other means familiar to him from his previous studies. The battery made by Volta is credited as the first electrochemical cell. It consists of two electrodes: one made of zinc, the other of copper. The electrolyte is either sulfuric acid mixed with water or a form of saltwater brine. The electrolyte exists in the form 2H+ and SO42−. The zinc, which is higher in the electrochemical series than both copper and hydrogen, reacts with the negatively charged sulfate (SO42−). The positively charged hydrogen ions (protons) capture electrons from the copper, forming bubbles of hydrogen gas, H2. This makes the zinc rod the negative electrode and the copper rod the positive electrode. However, this cell also has some disadvantages. It is unsafe to handle, since sulfuric acid, even if diluted, can be hazardous. Also, the power of the cell diminishes over time because the hydrogen gas is not released. Instead, it accumulates on the surface of the zinc electrode and forms a barrier between the metal and the electrolyte solution. 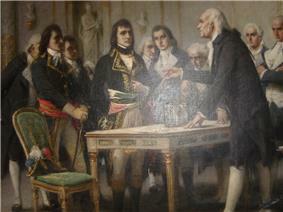 Volta explains the principle of the "electric column" to Napoleon in 1801. In 1809 Volta became associated member of the Royal Institute of the Netherlands. In honour of his work, Volta was made a count by Napoleon Bonaparte in 1810. His image was depicted on the Italian 10,000 lira note along with a sketch of his voltaic pile.